Part of the revitalization of our Downtown, the Lynn Veteran's Memorial Auditorium is once again one of the premier entertainment venues in the state! Please check out our event listings and come downtown to a show at the Lynn Auditorium! Thanks for visiting the City of Lynn's Memorial Auditorium website! . A Few Of Our Brightest Moments! The Staff at the Lynn Auditorium would like to thank you for making the auditorium a great success! What People Are Saying About The Lynn Auditorium! I've been coming to the Auditorium since high school! I can't believe how wonderful it is to see performers like Kenny Rogers and Peter, Paul and Mary right here in our own city...what a treasure! The Lynn Auditorium is a great place to see a show. 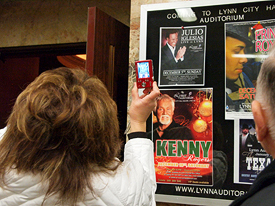 I have seen several shows at The Lynn Auditorium, and look forward to another great season of fabulous shows! You can see top notch entertainment at affordable prices.....and FREE parking. I have paid less for a ticket than I used to pay to park in Boston! Check out the Lynn Auditorium, you will be glad you did. Keep up the good work! The Lynn Auditorium Rocks! $4 beers, free parking, $40 tickets to shows? No other venue can boast what this place has. In a word, it’s awesome! What a wonderful experience. I bought my tickets at the box office, paid no fees, got to go into the auditorium to personally pick out my seats, and then got to see Kenny Rogers in the most intimate setting ever! There isn’t a bad seat in the Lynn Auditorium. Even the last row is better than 99% of the seats in Boston!